This was a favourite concert from the CSO and not just because of the double bass concerto, but it had an array of musics. Beethoven Symphony no.2. Beethoven is always good and this was a blow out. Nicely played, tight, neat, together, with some prodigiously fast lines in bass. The Ninth has its moments but perhaps this has more. I'll have to revisit the 9th to check. Beethoven was the last thing for the night. First up was Vaughan Williams Fantasia on a theme by Thomas Tallis. Again neat and thoughtful playing. I noticed the four string principals playing a string quartet role but the orchestra also entered as well as a reduced orchestra of first desks. The Tallis theme is played three times and a secondary theme appears on solo viola and forms the climax. Prior to Beethoven was a short work in three movements by Paul Stanhope called Morning Star written as his response to Indigenous music in Arnhem Land. The double bass concerto was a star for me, obviously. 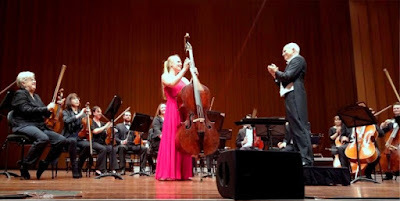 Phoebe Russell played Vanhal Double bass concerto Dmaj. PR is trained in Victoria, VYO, ANAM and two years on a scholarship associated with the Berlin Phil, no less. Only 24 and she's returned, seasoned, as the Principal bass in the Queenland Symphony. A modicum of both talent and hard work, no doubt. I unavoidably missed her recent solo concert but was in the front row for this one. Some technical matters: a very small double bass from 1700 with large F-holes and 40" scale (I'm told), just less than 3/4; flat back; narrow neck that suggested to me a conversion from 3 strings; classical bow; Belcanto strings? (orange wrapping). I loved her technique, too: flexible and apt to the phrasing; thumb and some freer techniques up high; harmonics beyond the neck; third finger used on some vibrato; neat finger changes to hold notes or continue phrases. A pleasant and gentle tone with form if not too loud. Seriously intriguing playing throughout. Long practice and some serious training shows, and I think a preparedness for technique to be flexible subject to notes and phrasing. Not sure I'm saying much, but a great pleasure for me with a great view. And an attractive piece. Perhaps I'm coming around to double bass as a solo instrument, at least in hands like these. 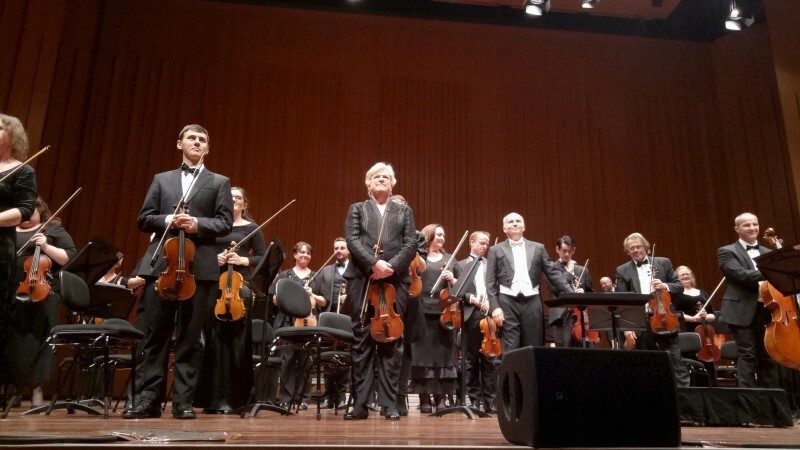 A great pleasure as was the concert itself: a great pleasure all round. 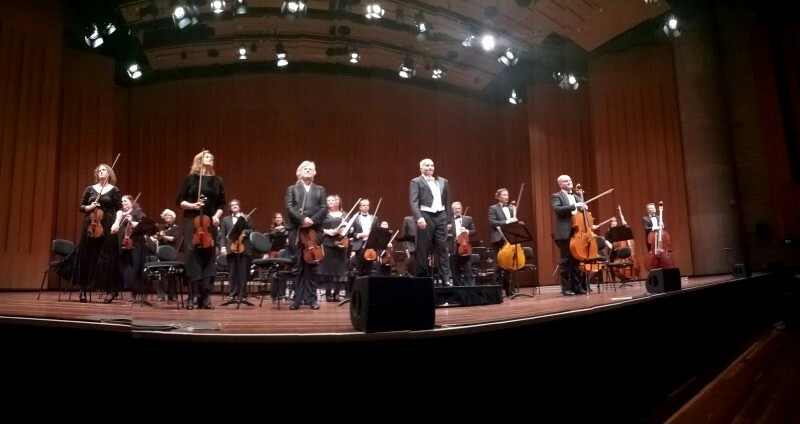 Canberra Symphony Orchestra performed Beethoven, Vaughan Williams, Vanhal and Paul Stanhope. Johannes Fritzsch (conductor) conducted and Phoebe Russell (double bass) soloed on the Vanhal Double Bass concerto in D major.